2018 One WHIRL Yoga Fest + Healthy Lifestyle Expo-July 14th 6AM-4PM and July 15th 7AM-2PM-Price:$35 Early Bird for both days. Vendors include: Isagenix, UrbanFitCo and Ultra Matcha. For more information visit https://www.eventbrite.com/e/2018-one-whirl-yoga-fest-healthy-lifestyle-expo-tickets-44770484725. 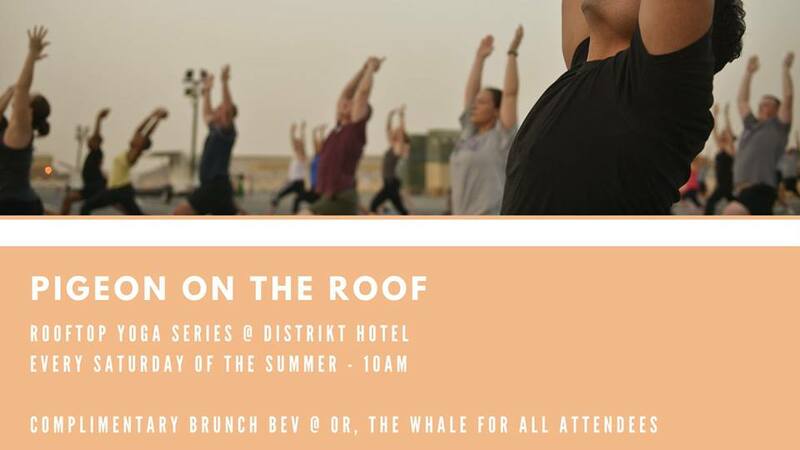 Pigeon on the Roof - Rooftop Yoga-Every Saturday at 10AM-Distrikt Hotel- Free-Reserve spot at https://www.eventbrite.com/e/pigeon-on-the-roof-rooftop-yoga-tickets-47664307226. Complimentary Brunch Bev after at Or the Whale (Stay for brunch too). Yoga in the Square-Every Sunday at 10 AM and Wednesday at 5:30PM-Market Square Downtown-Free-get there early for a great spot. Summer Yoga Splash-July 26 & August 23rd-6PM-8PM-Carnegie Museum-$10 (Members $8 and Students $5) For information visit https://cmoa.org/event/summer-yoga-splash/. Yoga Day at PNC Park-August 5th-PNC Park-Tickets start at $35-Includes ticket to the game. For the schedule of the day, information and to purchase tickets visit https://www.mlb.com/pirates/tickets/specials/yoga-day.